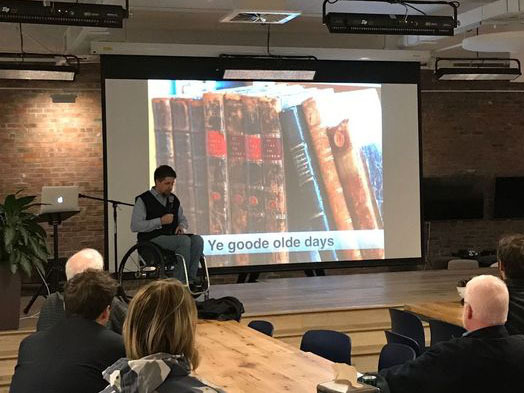 I often present about accessibility at tech conferences. I do it because I believe in sharing the expertise I have gained over two decades of working in that field. I also talk at conferences because I want to see a more inclusive web. But there are costs involved in doing that. I heard something recently that indicate some people don’t understand the impact, financial and otherwise, on the speaker and their families. Sure, it sounds fun and romantic to be travelling once or twice a month to a different city to present at tech conferences. And it is fun, otherwise I wouldn’t do it. But it’s not all fun and games. It takes time, effort and money to do this. This post isn’t a complaint about the impact – just trying to tell it the way it is. I only pitch to conferences who offer speaker packages that include at least airfare, hotel and free entry to the conference. In theory, that means I’m not left with personal expenses I must cover myself. In practice, there are always expenses. Some conference organizers arrange rides to and from the airport where the conference is being held, but not all. I have yet to be offered reimbursement for ride to and from my departing airport. That’s $50 each way. Some conference organizers arrange for breakfast and lunch during the event. Or one, or the other. And there are usually a speaker dinner, or one or two other social events in the evening. Yet, it is rare to see all your meals covered. Typically you end up having to eat out, or eat from the hotel’s restaurants. Even if you order pizza for delivery, it is more expensive than if you cooked a meal at home. A good presentation takes time to create. Even if you know your subject inside out as I do, you have to think of the best way to present the ideas. Every speaker I know has a different workflow. Mine starts with creating an outline of what I want to say. If it’s a technical presentation, I have to work on code samples. I then need to build my slide deck. A good slide is engaging, illustrates the point, but doesn’t overwhelm the audience. Creating good slides takes time. Once I have my outline, talking points and slides, I have to practice my talk. I don’t write out exactly what I’m going to say and learn that by rote. Yet I do run through the presentation several times to make sure there’s a good flow. I want to avoid forgetting important points. I want to ensure I don’t stumble on words or concepts. I spend up to an hour per minute of presentation in creating a new talk. That’s about 30 to 40 hours per new talk! Even if a conference accepts a talk I’ve already given elsewhere, I have to spend time preparing for it. Not as long as the first time. But given it can be months between presenting the same talk, I have to check and see if my material is still up to date. If it isn’t, I have to update it. And I rehearse the talk a few more times before presenting it. Typically, you have to balance your paid work with the time you spend at conferences. If your employer isn’t paying for you to attend, either you have to work through the conference days – which is a disservice to the conference organizers and attendees, or you have to make time up somehow. Speaking at conferences typically means I spend time away from my family. Sometimes we can afford to go together as a family, but that’s the exception more than the norm. Being on the road 5 to 10 days out of every month, for months on end, takes its toll, even on the most understanding spouse or children. On average, it costs me between $150 and $500 to speak at conference, in actual expenses. Plus $3,000 to $4,500 of my time to prepare the presentation. So it costs me quite a bit of money to do public speaking. And it has an impact on my family. This can’t be quantified in terms of dollar cost. But I keep doing it because I believe my message is important and I want to share my knowledge. And I keep learning new things when I present and mingle with other people that present at and attend conferences.